You’ll often hear us Cruzio folks talking about how important privacy is to us, an ISP. We’ve spoken at length about how we won’t mine or use your data, or how we won’t ever sell your data to third parties. But what exactly does that mean? What data’s being collected, and who exactly is affected? You might’ve seen the much-retweeted post recently from @iamdylancurran outlining all the things tech juggernauts like Google and Facebook were keeping and tracking. Well, we were so blown away by that, we decided to go through the steps ourselves. Below are 8 links and settings that you can look at on Google and Facebook that will tell you exactly what data they’re getting from you, so you can take a look for yourself. If you have a Google account, and location services is on (most of Google’s services require location services to be turned on, so you most likely do) then Google can show you exactly where you’ve been since it’s been on. If you click through the above link while logged into your Google account, it’ll show you on a map all of the places you’ve been throughout your account’s/mobile device’s history, and even how long it took for you to get between places. If you don’t like this timeline, you can turn it off by hitting the “Manage Location History” button and switching the feature off at the bottom of the screen. Note that this means it just stops plotting the data on a map for you to see. It’s not stopping Google from collecting the data through location services however. 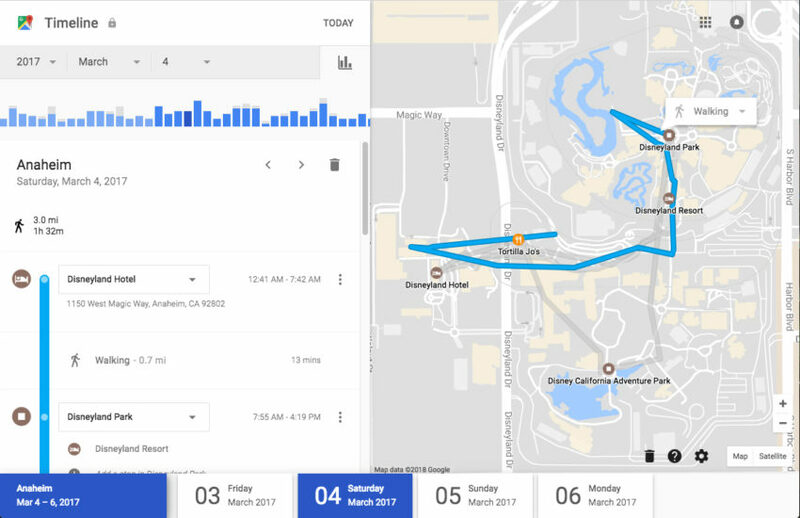 As a quick aside, Google Location Services is what allows Google’s apps and apps that use Google’s account services to know where you are. Google Maps’ navigation, for example. Of course, Google can use this data to advertise to you. For example, seeing an ad for a nearby restaurant when you’re close by. If you’ve ever deleted your browser history and thought it was over and done with, that’s not quite true. Google stores all of the activity that’s been done on your Google Account, and you can see a record of that on the link above. And this stays around even after you delete your search history. Keep in mind this isn’t just searches, but also stuff like app usage, video history from sites like YouTube, and more. It’s surprisingly thorough. If you don’t want this data displayed, you can change these settings on your Google Account so that it won’t show this stuff in your timeline. You can find all of these options right here: https://myaccount.google.com/activitycontrols. This will let you pause the timeline feature, or even delete your entire timeline history from being shown on your account. It will also stop them from being able to use this data to affect your search your results though, so your search results will no longer be personalized based on your previous usage patterns. Google’s biggest money maker is its advertising business, so it’s no surprise that Google’s algorithm uses all the information it knows about you to can target ads that you’ll probably want to click on. If you want to see what Google “thinks” about you, you can click through to the link above and it will show you demographics that it thinks you fit into and subjects that it thinks you like. On this page, Google actually does give you the option to turn this off. It even lets you delete and add topics that you may or may not be interested in, if you want to make the targeting more or less specific. Have you ever opened an app and signed in using your Google account? Or allowed it to access parts of your account, like Location Services or Contacts, when you opened it? Most apps these days require some sort of permissions, so the answer to that is likely yes. At the link above, you’ll find Google’s list of all of the apps you’ve given permissions to, and it lets you edit or delete those permissions. Keep in mind, if you do decide to change these permissions, it could affect the ability to log into or use these apps. Google knows every search you’ve made, video you’ve watched, comment you’ve left and community you’re a part of on YouTube, and keeps a record of it. At the link above, you can take a look for yourself and see their history of YouTube videos you’ve seen. You can also delete that history if you wish, and pause/stop the site from showing this history on this page. If you really want to know everything Google has on you all in one place, Google’s takeout feature is what you’re looking for. Google will send you a copy of all of your data from its many services (with some exceptions: they’re not sending you all your emails from Gmail, for example) in a series of folders. In them you’ll find records like your search history, all the YouTube videos you’ve uploaded, your Contacts, and your transaction history on Google Pay, among many, many other things. Once you have it downloaded, you’ll have a folder that contains logs of all of your Facebook chats, every file you’ve ever been sent on Facebook, all your photos, and even every sticker you’ve ever sent, and much more. 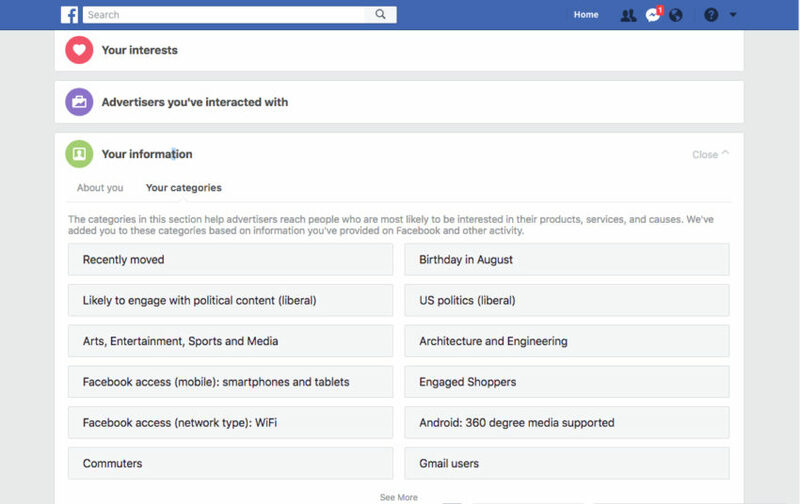 By checking Facebook’s settings, you can also see what interests and personality traits Facebook thinks it knows about you, for the purpose of targeting ads on your Facebook feed. To take a look at these, click the down arrow again, and go into Settings. Then, in the left-hand column, click Ads. From there, click Your information, then Your categories. There, you’ll see a list of traits, such as what Facebook thinks your political leanings are, what devices you use Facebook from, what interests you have, and when your birthday is. Facebook lets you delete these traits if you think they aren’t relevant to you as well. These 8 things you can look at are just the tip of the iceberg as far as what data about you that’s left on the internet. This is what Google and Facebook are being transparent about, as these are publicly accessible tools on their respective platforms. It’s quite likely that there’s a lot more data out there about you from Google, Facebook, or other websites that isn’t quite as transparently available. Listen, don’t get us wrong, we love the openness of the internet and we think Google and Facebook are fantastic, innovative companies who have developed world-changing platforms. But this is why we here at Cruzio Internet and Santa Cruz Fiber don’t mine your data: we believe that what you do on the internet is your business. It’s not our business, and certainly not some other company’s business. We don’t track what you’ve been searching or what pictures you’re messaging your friends, because we don’t think that’s right. We know that you’re an actual human being, and not a collection of data that can be used to sell a car. By changing your privacy settings, voicing your opinion and supporting companies who share your ethical concerns you’re helping build a better internet for everyone.